Last year, when I had to eliminate all good things from my diet, the most difficult to give up was cheese. Oh, how I loooooove cheese! After 5 months without it, I’d lost 30 pounds and felt much better. Now that I’m able to eat it again, I’ve got to be a bit more selective about it. So, I’ve started new recipes that call for a bit less of it but enough of very flavorful varieties that it stretches the cheesy goodness. This is one of those recipes. Next time I make it, I’ll add fresh herbs to the polenta and probably increase the amount of Gorgonzola. This was a unique and delicious appetizer that is convenient, due to the fact that it’s finger food which is perfect for passing at a cocktail party. Prepare the polenta. Pour the hot polenta into a lightly oiled 1.5 quart loaf pan. Let cool, then refrigerate, covered with plastic wrap, until needed. Place the olive oilin a medium sauté pan. Add the peppers and salt to taste. Cook over medium heat, covered, stirring often. If needed, add sugar to taste, from a small pinch to a large pinch, according to sweetness of peppers. Cook until the peppers are tender and soft, about 10 to 15 minutes. Unmold the polenta and slice into 16 ½-inch slices. If desired, trim polenta to create straight-sided rectangles. Cut each slice diagonallhy into 2 triangles. 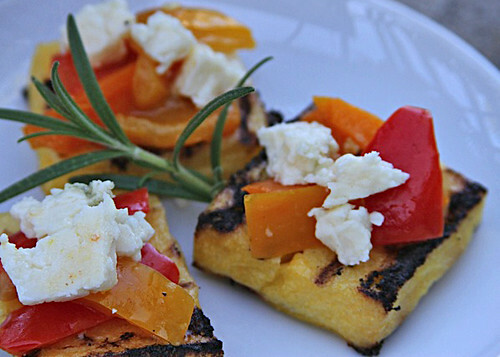 Lightly brush polenta on both sides with olive oil and arrange on baking sheets. Place polenta under the broiler, turning once. Cook polenta triangles until crisp on the outside and flecked with brown, about 4-5 minutes per side. Top each triangle with a little of the pepper mixture. Using a teaspoon, top with a little Gorgonzola, about ½ teaspoon per triangle. With the heat off, return polenta triangles to the oven (not under the broiler) for just a moment to warm but not melt the Gorgonzola. Serve immediately. Bring the water to a boil and add salt. Quickly add the polenta in steady stream, stirring continuously with a wooden spoon. Reduce heat to medium and continue stirring for 5 minutes, or until the polenta is thick, soft, and smooth. Pour polenta into a moistened 1.5 quart loaf pan or onto a lightly oiled 10.5 X 15.5 inch baking sheet (this is my preferred method when making crostini or stacks). Smooth the top with a wet spatula. Let col. If making ahead, cover with plastic wrap and refrigerate for up to 24 hours. Proceed as directed in recipes calling for polenta. Another stellar appetizer from Katy’s kitchen!